Includes an intriguing depiction of the Philippines with exaggerated mapping of the Cagayan River! 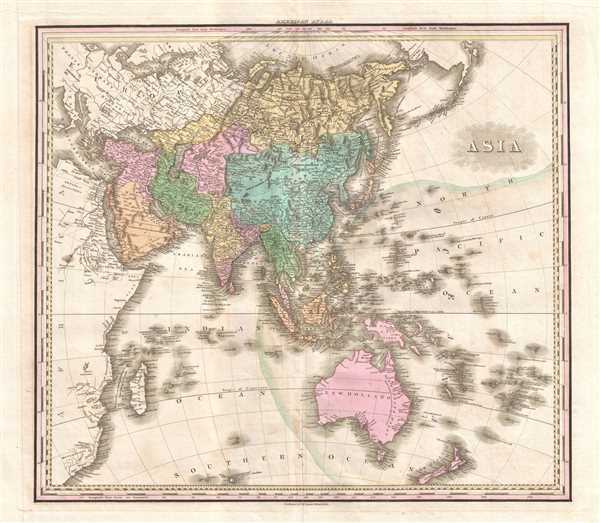 This is an 1825 Henry Shenk Tanner map of Asia. The map depicts from continental Europe and Africa (though both are uncolored) to Alaska and from the Arctic Ocean to Australia, South Africa, and the Southern Ocean. A few intriguing details are present here, including Hokkaido not being included in the islands of Japan and Luzon, in the Philippines, is bisected in such a way that it resembles two peninsulas. Singapore Island is labeled, as are Persia, Tibet (Thibet), and Nepal (Napaul). All countries are identified by different colors. This map was created and published by Henry Shenk Tanner for the 1825 edition of his A New American Atlas. Very good. Even overall toning. Light transferrence. Verso repair of fold separation.